Below is a really neat article (that I've edited slightly, so click the link at the bottom to read the full article) about Margaret Roach Wheeler. She's a fiber artist and clothing designer, and her work exemplifies how contemporary Native fashion designers look to storytelling traditions as sources of inspiration to create new garments. Many Native women of the past also looked to stories as a source of creativity, and I'm proud to see designers such as Wheeler who continue this legacy. Margaret Roach Wheeler is a storyteller. She doesn't rely on the written word or spoken prose, but fabric, literally weaving a tale. A fiber artist based in Joplin, Mo., Wheeler is the owner and designer of Mahota Handwovens, a beautiful collection of elaborate garments inspired by her Native American ancestry - specifically, her Chickasaw-Choctaw roots. "I have pieces that are very emotional," she said during a phone interview, alluding to garment tributes she's made to her mother and father. In a way, her creations offer a back story about Wheeler, whose grandmother taught her to sew at a very young age. "I was surrounded by clothing," she said, remembering her grandmother knitting and crocheting dresses and three-piece suits. Her dad was a teacher through the Bureau of Indian Affairs, so Wheeler grew up on school campuses, including Sequoyah High School in Tahlequah. There, she remembered seeing a room with looms for teaching weaving as a trade. She also recalled the colorful murals in post offices and schools, created through the Federal Art Project of the Work Projects Administration. They had a great influence on her. And so did her family's history, generations of which has been passed down. "Having my history written for me has absolutely been very integral into what I do - to have that history and to know about it, to have my family be very proud of it," said Wheeler, who studied weaving during her master's work at Pittsburg State University in Kansas. She's been weaving ever since. "So many people don't have any idea about their great-great grandmother and what they did," said Wheeler, whose great-great-great grandmother's name was Mahota, after whom her business is named. Her grandmother lived with the family, and she'd tell Wheeler stories about their ancestors. "It made it very precious for me," she said, adding it probably had much to do with her style of work. Wheeler makes "street clothes," she calls them - her version of ready-to-wear, she allowed us to analogize. 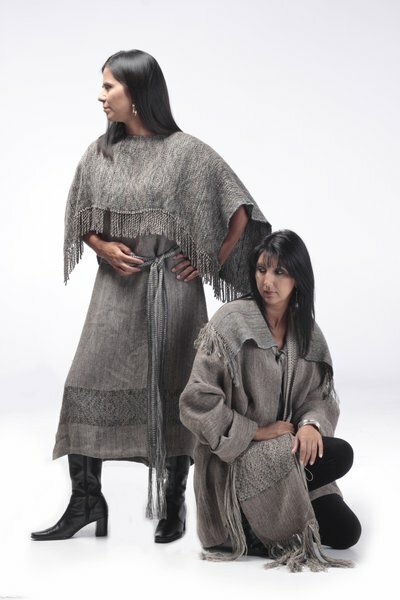 All one-of-a-kind and hand-woven, they include colorful dresses, tops, coats, even men's apparel, all contemporary interpretations of Native American garments. But her Mahota collection is more like art - wearable, of course. And each comes with a story. Like her "Requiem for a Raven," a long, gorgeous red-and-black robe with an almost Egyptian-like headdress shaped like a raven. The raven is perched proudly at the top, she explained. "And there's a whoosh of color in the wing structure, and that's the raven flying up at sunset." The closure at front is two wings, and on the inside are hand-painted silk feathers that are falling - like the lost soul the raven is flying to. When she lectures about the development of style, she asks people to look at their own heritage, to draw from their own history. "We all can do that," Wheeler said. "I just feel very fortunate that mine was Native American." Click here to read more from this Tulsa World article.